15 August 2014.—Recent events in Ukraine, part of which was annexed by Russia, while another part became a war zone owing to the actions of pro-Russian separatists indicated, among other serious consequences a severe crisis of the existing political architecture in Europe, with potentially wider international repercussions. Such principles as international security guarantees, the existing friendship and partnership agreement between Ukraine and Russia, and the “inviolability of sovereign borders” norm were effectively trampled by the Russian government in its pursuit of a dangerous revanchist course. These events also indicated a glaring need for analysis of the past and the present history and dynamics of border relations, for determining both commonalities and regional peculiarities, and, if possible, foreshadowing the future course of international and regional relations. 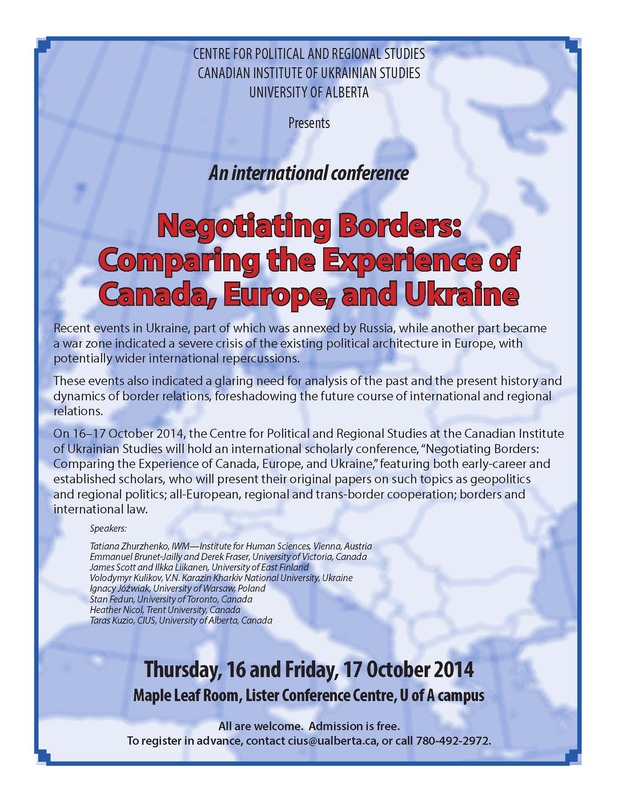 On 16–17 October 2014, the Centre for Political and Regional Studies at the Canadian Institute of Ukrainian Studies will hold an international scholarly conference, “Negotiating Borders: Comparing the Experience of Canada, Europe, and Ukraine,” featuring both early-career and established scholars, who will present their original papers on such topics as geopolitics and regional politics; all-European, regional and trans-border cooperation; borders and international law. 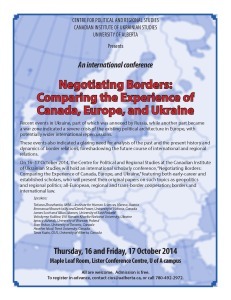 The conference program is available here. To download a PDF copy, click here. In the video box below, you will be able to view and listen to all conference presentations. Having trouble viewing the video? Please try the conference page on Livestream.